No trip to Montana can be complete without a visit to Billings. The biggest city in the state, Billings is home to around 110,000 people, with 170,000 in the full metropolitan area. This city is located in Yellowstone County and initially began life as a small railroad town when founded in 1882 but very rapidly developed into a major cultural, economic, and industrial hub for the state, earning the nickname of 'Magic City' due to its swift growth and development. Billings is the only city in all of Montana to have a population in excess of 100,000 and is still one of the fastest growing cities not just in the state, but in all of the United States. It's a very popular touristic city due to its prime location very close to many big parks and natural landmarks, as well as being the home to some fun attractions like the Yellowstone Art Museum and Zoo Montana. Local points and areas of interest around Billings, MT include Chief Plenty Coups State Park, Pictograph Cave, Pompey's Pillar, and more. The likes of Yellowstone National Park, Little Bighorn Battlefield National Monument, Red Lodge Mountain Resort, and Bighorn Canyon National Recreation Area are also situated relatively close to Billings, making it a super city for outdoor enthusiasts and nature lovers looking to enjoy some outdoor activities like hiking, climbing, biking, camping, and kayaking. One of the best ways to visit Billings is in an RV as the local area simply has so much to offer, and there are several highly rated RV parks and campgrounds in the surrounding Billings area to make your stay in Montana's biggest city as enjoyable as it can possibly be. Read on to learn all about the very best RV parks in Billings, MT and choose the best location for your next camping trip in this location. When you choose an RV park, you want a location you can trust. There are plenty of great independent RV parks out there, but some aren't quite as enjoyable to stay at, so it can be a good idea to choose a branded chain of RV parks that has built its way up as one of the top names in the business. That's exactly what KOA (Kampgrounds of America) has done. With hundreds of locations, including one right in the heart of Billings, MT, KOA has established itself as a leading provider of top quality RV parks. The Billings KOA Holiday is a great example of why KOA Is such a beloved name in the RV world. This park, which is open from April to the end of October of each year, has earned a very impressive 4.5 star rating from hundreds of past guests and actually holds the unique distinction of being the first ever KOA location. 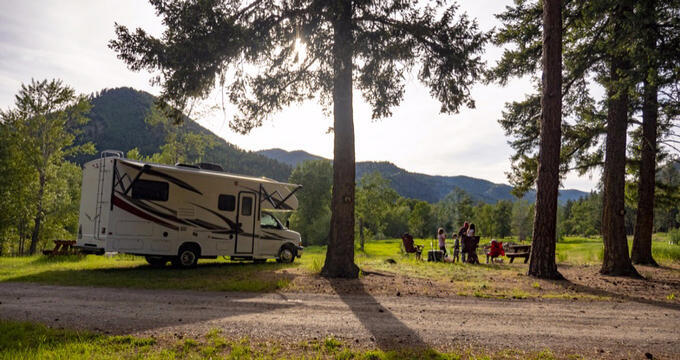 Right on the banks of the Yellowstone River, this RV park has a huge list of amazing amenities to go along with its extremely large RV sites. The sites can measure up to 100 feet in length and come with all the standard full hook-up services, as well as complimentary cable TV and Wi-Fi. On-site amenities here include a snack bar, communal kitchen, bike rentals, firewood sales, a hot tub, a seasonal swimming pool, fishing areas, a mini golf course, restrooms, showers, and more. One of the top rated RV parks in all of Billings, MT, the Billings Village RV Park has received a lot of very positive reviews from past guests, with many people returning to this RV park for repeat visits due to its cleanliness and excellent standards of service. It can also boast of a great location, offering a quiet little oasis right in the heart of the city, only minutes away from some of the top parks, restaurants, and attractions of Billings. Billings Village RV Park is open all year long and features a total of 75 individual full hook-up RV spaces that can suit recreational vehicles of all shapes and sizes. The rates at this Billings MT RV park are very affordable and the park itself has been privately owned and operated for over four decades now, so has stood the test of time and only gotten better as the years have gone by. The on-site amenities here include very clean restrooms, private showers, lots of laundry machines, a play area for young children, reliable wireless internet, complimentary cable TV channels, a bike trail, a book exchange program, and more. One of the primary reasons people visit Billings, MT, is to enjoy the breathtaking beauty of the natural surroundings and the iconic Yellowstone River, and you can be situated just a couple of minutes away from the rushing waters of that river if you choose to stay at Yellowstone River RV Park & Campground. Conveniently situated right by Mystic Park for all sorts of outdoor activities, while also being nicely located for trips into Downtown Billings, this RV park is in a great spot, not too far from the Billings KOA location. Yellowstone River RV Park & Campground is a family owned and operated location, so you can be sure of a warm welcome and friendly service at all times, with a very family-oriented vibe being enjoyed throughout this spacious RV park. Both back-in and pull-thru RV sites are found at this RV park, which also comes with a long list of features and facilities including a gift shop, a pavilion that can be rented out for parties and special occasions, paved roads, a general store, a spa, a swimming pool, wireless internet access, lots of grassy areas, a nature trail, a video game arcade, laundry machines, a play area for little ones, multiple dog parks, a basketball court, and RV supply sales.